Cascade Aerospace is proud to offer the ability to provide modifications to aircraft of all types. With true dedication, we strive to create an aircraft that will fit your exact needs. Highly experienced, Cascade excels at major structural modifications, Service Bulletins and Airworthiness Directive incorporation, and system upgrades. Modifications and Upgrades include In-Flight Entertainment, Winglets and other aircraft performance enhancements. Full STC development capabilities exist within Cascade Engineering having developed over 100 commercial STC’s. 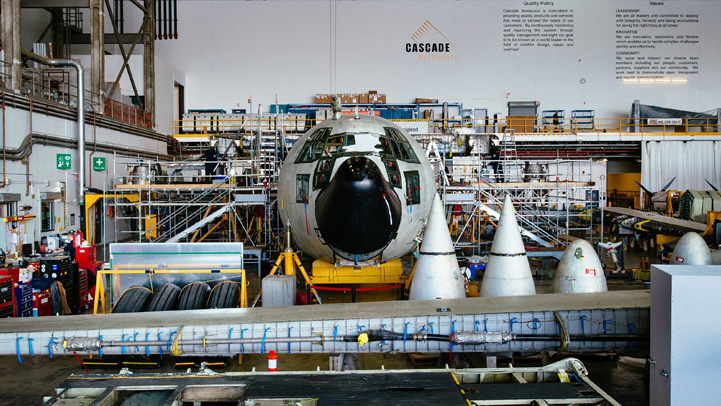 Cascade is a leading after-market product and services provider, offering aircraft upgrades and specialized modifications for Bombardier, Boeing, Lockheed Martin and other manufacturers. Cascade has established itself as one of the world’s foremost maintenance support providers with a reputation for developing optimized solutions. Cascade has designed and embodies approximately 50 different modifications to address obsolete systems, airworthiness and durability issues for the C-130 aircraft.